Last week, I traveled to Annapolis, MD to attend a wetlands class for work. It was a great week, filled with field trips, dinners with friends, and on my last day, a few hours at the Local Yarn Shop. After asking around and doing some internet research, I quickly learned that "The Yarn Garden" was the place to be. Nestled on the second floor of a fairly large shopping complex, it took me a few times around the parking lot to notice the unassuming sign. But once inside, I was in for a treat! Inside, there was a little bit of everything. 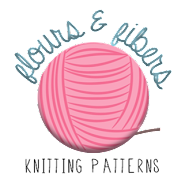 The store is a knit, crochet and needlepoint shop. I always love seeing all the tiny skeins of embroidery floss and needlepoint yarn! They also had all kinds of curiosities, like this gnome needlefelting kit. This was really hard to resist!﻿ And they carry one of my favorite yarns of all time, Manos Silk Blend. This is the yarn that I used for my mom's Christmas present. I made her the Lovely Leaf Lace Scarf from the Purl Bee. I couldn't get everything I wanted, though, because I had over three hours to stay in the shop before I had to leave for the airport, and limited luggage space to bring back my treasures. So before I bought anything, I sat down at the table and started knitting. It was then that I met a few of the shop's wonderful employees. Robyn was there knitting on her day off. Maybe her family didn't understand going to "work" on your day off, but I certainly would do that too, if I worked at a yarn shop! Beth and Alex were both very helpful, and I'm glad I got the opportunity to knit with all of them during a q﻿uiet hour or so at the shop around lunchtime. Alex was so nice to let me leave my knitting while I went across the street to grab lunch. I met many of the shop's patrons, and all seemed very happy to be there. Including the 91-year-old grandmother, who took the bus to the shop to get some help on a baby sweater!! Of course, I couldn't leave empty-handed. Does this yarn look familiar? Yep, that's the discontinued Noro Silk Garden Lite that I used for the Dorrie Entrelac Cowl. I don't know what I'll do with three more skeins, but somehow my stash seems more complete with these new additions. I also picked up some Second Time Cotton, from Knit One, Crochet Too. This comes in many colors and is very affordable! I reluctantly left the shop at around 3 pm. But it didn't talk long for me to see another knitting project. 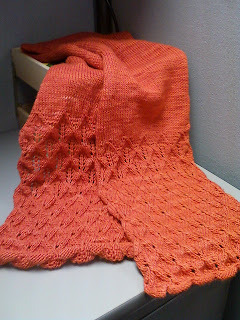 Meet my knew friend Rae's airport knitting! This sweet basket weave scarf is made from a beautifil skein of Miss Babs hand-dyed yarn. Rae split the skein and is holding the yarn double for this project. I was so happy she sat down next to me in the airport to talk knitting! And if you think that sounds like a good knitting day, stay tuned. I'll write about World Wide Knit in Public Day soon!